I’ve been buying large containers of blackberries at Costco the last couple months..the only problem is, I don’t care for whole blackberries. Madeline and Ross eat them, but there’s just too many in a container, so I’ve been trying to find other ways to use them. 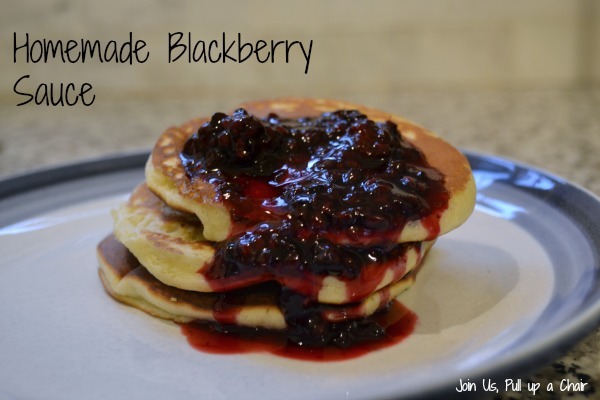 I found a quick and easy recipe to make homemade blackberry sauce – a perfect way to use up those blackberries taking space in my fridge. The recipe is so easy, just throw everything into a pot and let it simmer away on the stove. I served it warm over pancakes for breakfast one morning, but it’s also great to mix into yogurt. In a medium saucepan, combine the blackberries and sugar. Heat on medium heat for of until the blackberries and sugar starts to combine. While the blackberries are warming, mix together the lemon juice and cornstarch in a small bowl. Add in the lemon juice-cornstarch mixture into the berries and using the back of a spoon, mash the berries against the side of the pan. Bring to a boil and cook for an additional 2 minutes until the sauce thickens. Transfer to an air tight container – I used pint-sized Mason jars – and place in the refrigerator until ready to use.